1. What suggestions do you have about young people creating their online identity? For ex: professionals are told to have LinkedIn with followers because we have to network. As adults, we have a social media presence or we are considered odd. How do we guide them in understanding their online identity? 2. How do you defend “right” to check text with the argument that you are invading their privacy? 3. How do we handle disturbing behavior by our kid’s friends? Do we stay out of it? Or do we engage the school or parents? 4. Do you have advice for a single mother with little resources and no father figure? I have 2 teenage boys who I feel like I can’t control. 5. Is there any reason to keep some discussions with your kids about apps, social media failures, etc. private from your spouse? 7. How do you balance freedom for a 16-yr-old and being an authoritative adult who makes decisions? I know she is a 1 1/2 years from leaving home with college and no supervision. How do you know how much freedom is too much? 8. The desire for money, power, fame, and influence is a huge driver in all of this. But everything has tradeoffs. Can you talk about how to have this discussion without sounding like a killjoy? 9. Can you talk about the TBH (to be honest) free social networking app that lets friends anonymously answer questions about one another. TBH is a simple social networking app that lets you answer fun, whimsical questions about your friends and collect gems (trophies) every time your friends select your name in answer to a question. Once you give access to your phone’s contact list and location, you can select the high school or college you attend. Since there’s no age verification, adults can join or kids can say they attend a school they don’t. Ultimately, the app draws from your phone’s contact list first and then offers other app users from the school second. 10. 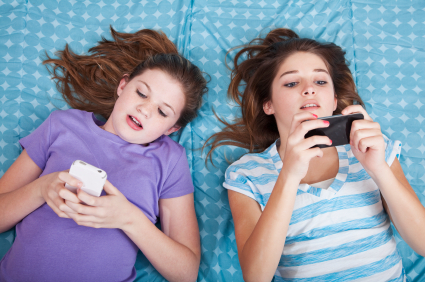 Sexting or sending inappropriate pictures are obviously popular among teens. What can be done about creating boundaries when our kids are not with us (ie: school, sports, church, etc.)? How can we protect our kids from being exposed to things they have not asked to be a part of, but are exposed to via group chats or unsolicited texts with inappropriate content?